I like to think of myself as someone who enjoys most new technologies, electronics, and things that go beep. One thing that I’ve hated since they blew up in popularity are drones. Especially after seeing what people had done with them, like the private citizen who mounted their pistol on a drone and are able to fire at the push of a button. Unlike our military, a private citizen would have no true need for a drone mounted gun, but I’ll set my politics aside because I’m sure I’ve already upset someone. Anyway, in the explosion of popularity that drones experienced, I have just seen so many forms of misuse that make me question if these should be owned and operated by the public. Again, I’ll set my politics aside because this could be a good debate for another day. Recently, I’ve been becoming more of a fan of drones. And while I don’t see myself buying one at any point, they can be useful for archaeology so I’m finding myself seeing the good in them. Like any other tool, there is no inherent good or bad, just how they’re used and who uses them. Looking at drones in archaeology today, it seems like they’re primarily being used for aerial photography which makes sense. The cost of a drone and a reliable camera would likely be cheaper than having to rent the services of someone who takes aerial photographs, particularly if you consistently have a need for up to date aerial photographs. So, this makes total sense to me. But drones do not stop with regular old aerial photography, they’ve been used with thermal imaging cameras which don’t sound all that different or useful compared to aerial photography overall. However, if you keep in mind that different materials hold heat differently, suddenly structures buried in sand or covered in vegetation are potentially visible. We’ve even seen drones being equipped with ground penetrating radar, which could provide higher accuracy in data collection by taking out some of the human error. If we can apply drones like this, then who knows how else we could use them in archaeology? Let’s just hope that drones, and other cool robots, can’t completely replace us, not yet anyway. It’s that time of the semester where things just seem to get crazy. You have little to no time and a half-dozen papers to finish by the end of next week. Stress levels are rising, and you find yourself eating more from the vending machines than the actual food you might’ve prepared and stored in the undersized grad student minifridge. Alright, maybe I’m projecting my own problems onto the situation here, but I think you get the idea. It’s just the time of the semester where everyone seems to get stressed. So, between myself and several other grad students, we have put together a list to help accomplish your goals, destress, and survive to the end of the semester. List out what you need to do and manage your time. I know this is a cookie-cutter type response, but there is merit behind it. Set a schedule of what you need to get done by when, section off the time you’ll have to work on each project or what you think it will take to accomplish it. If you finish something off, scratch it off your list. As the day goes on, you’ll see that you’ve been productive and that might just motivate you to keep going. You need to rest at some point. Sure, working hard is a core aspect of grad school, but you don’t need to wear the bags under your eyes like a medal of honor. Realize that you are a student. I’ll repeat that again for those in the back, you are a student. This is the time for you to learn and make mistakes. If you mess up, use it as an example to learn from and move on. Ask for help. You are probably surrounded by your peers every day, there is no shame in asking for help. If your peers can’t help you then reach out to your professors. Take time for yourself to relax, unwind, or whatever. Just give yourself that time to do whatever you want to do. I find that having a feeling of needing to do nothing from time to time helps keep myself on track. So, whatever you want to do, do it. Don’t know what you want to do? Lucky you, I polled some of the other grad students for their preferred ways to relax: play a video game, maybe something mindless and violent like GTA5; wine and dine yourself; go for a drive somewhere scenic if you can; spend time outside, maybe get a nice walk in; binge your favorite show on Netflix (or whatever streaming service or format you prefer). Hopefully this quick list is of some help to you potentially over-stressed reader. Remember, you can do it! It’s that time of the semester again. It’s time to start looking at future courses. For some of the budding archaeologists, that means applying to a field school. 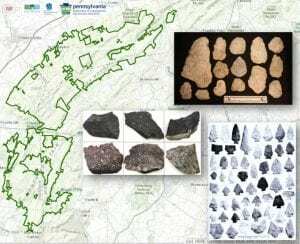 This leads me to the main point, this summer the IUP Anthropology Department will be hosting a summer field school at the site of Newport, Pennsylvania from July 8-August 16. It is open to anyone who is interested in learning about how archaeology is done. What happened at Newport? Great question, convenient voice from nowhere. Newport was the first Euro-American town settled in Indiana County and dates to around 1790. At least, it was founded by then. Being located along the Conemaugh River with a natural stone wharf, Newport was a river town where produce could be loaded onto boats and shipped around, eventually reaching Pittsburgh. Newport may not have been a large town but by 1816 there were around 30 families living in town. The town was also comprised of a nail factory, post office, store, and hotel. As time went on, the post office would shut down (1818) and the town was slowly abandoned throughout the 19th century. What would you be doing there? That’s another great question my friend. This answer varies a little bit depending on the specific course you’d take. 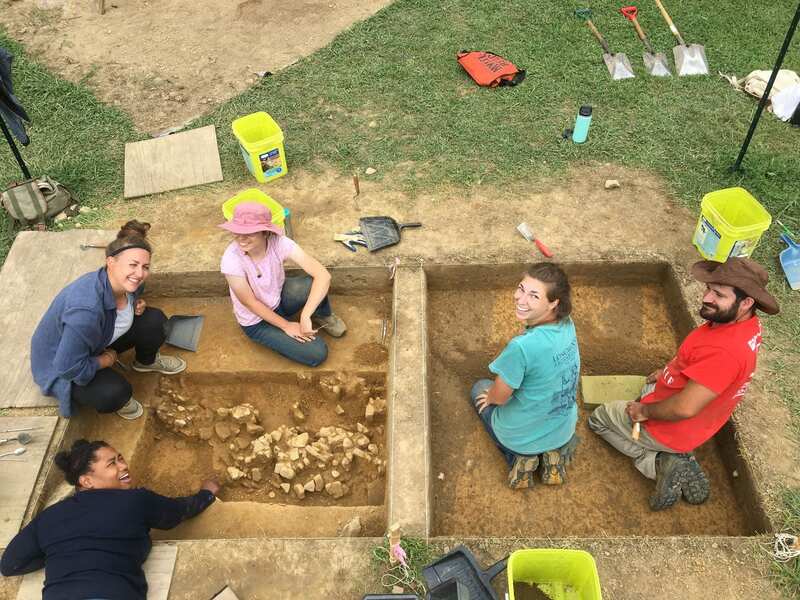 There is, of course, the base Archaeological Field School (ANTH 320/520) which acts as your introduction to archaeological survey, field excavation, and laboratory processing. This means you will get experience in necessary skills like test unit triangulation and excavation, screening, profile and plan mapping, shovel probe excavation (shovel test pits), and compass orientation in the field and proper handling, cleaning, and storage of artifacts in the lab. 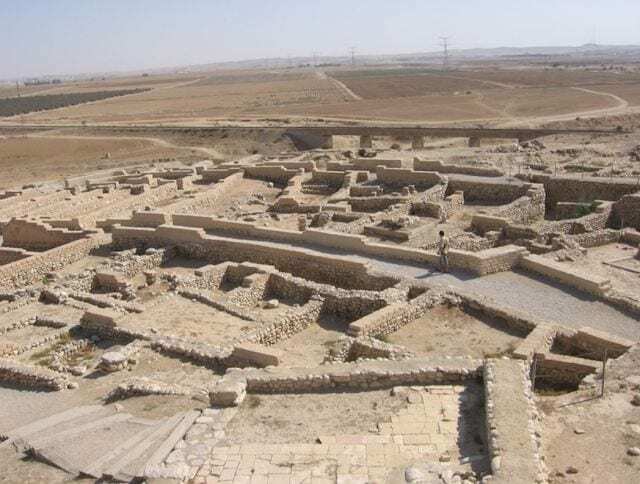 There is also the Advanced Archaeological Field School (ANTH 740) which, as the name implies, is the advanced instruction in survey and excavation methods with an emphasis on the application of research designs to field settings and the logistics of supervising projects. This course is intended for those who have already had a field school and want to learn more about running an archaeological project. Both courses will be part of geophysical and test pit surveys around the store, hotel, and nail factory. These surveys will be followed by excavation units to explore the various features and geophysical anomalies found through surveying. Now, there’s something I always thought to be amazing, and that is what you gather from the field school contributes to the archaeological record. Your field notes become documentation of the experience. You, in your own way, will add to the record and our understanding of this site. 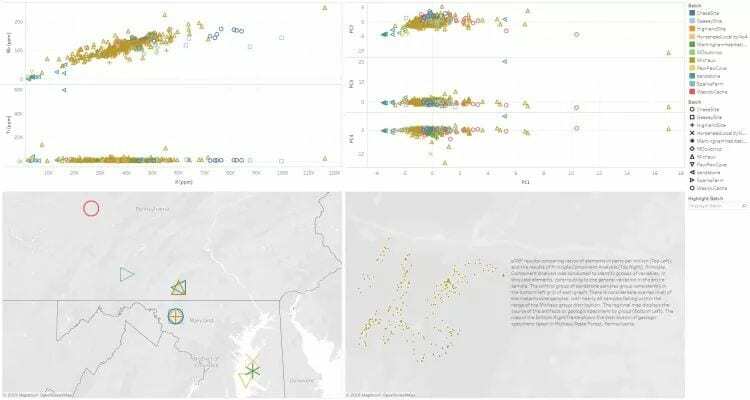 Maybe it’s just being part of the data collection or an artifact drawing in your notes (or in my case, counting the trains that pass by on a daily basis) but you will have helped gather information about the site that was not known before. Frankly, there’s little we know about Newport beyond that synopsis a few paragraphs above. The initial surveys will add to our knowledge of the site boundaries and the site integrity, this is what you’ll be apart of right from the start. 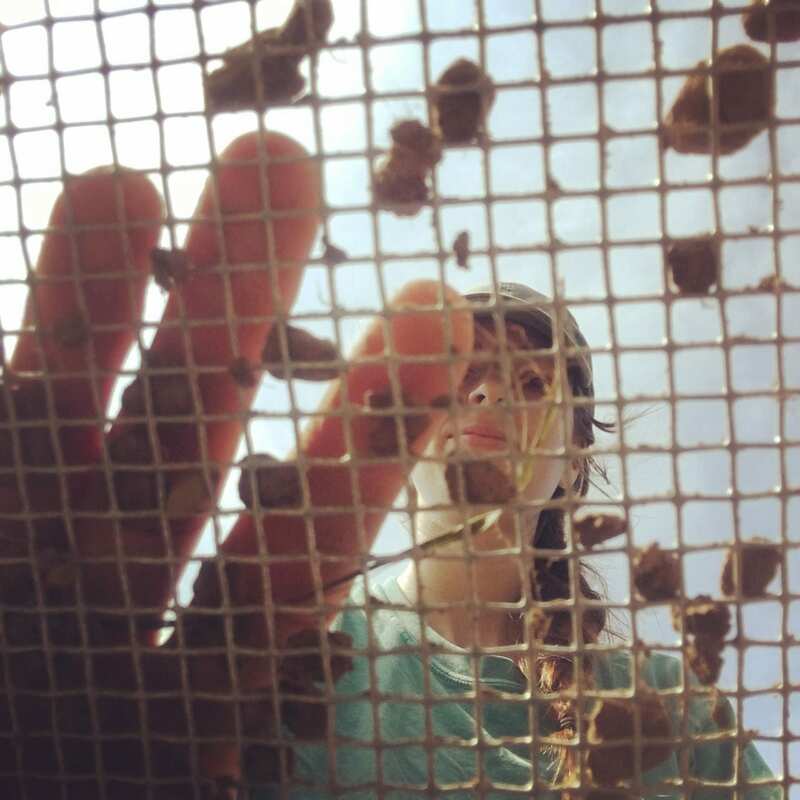 Maybe that’s less exciting when you’ve had some extensive experience, but the idea that what I did in field school matters is exhilarating to me. If you’ve made it this far, thank you. I hope that you’ll indulge my rambling for just a bit longer. Field school isn’t just something you need to be an archaeologist, it is something you need to really experience archaeology. The fieldwork isn’t for everyone, but this is your chance to find out if you enjoy it. Let’s be real here, not every day is pleasant. Sometimes it’s just too hot or a rainstorm appears out of nowhere. You could get bit up by the local bug population or sunburned. If you’re not experienced in manual labor, going out under the sun day after day can be tiring. While this might sound unpleasant, this is how archaeology is in the field. I don’t want to scare anyone away but that is fieldwork, but fieldwork is also working together with your peers and instructors, gaining skills as you do so. Grads and Undergrads working together. Now, I can never make guarantees, but if my experience is worth anything, I will tell you that going to an IUP field school is an amazing experience. This experience is enhanced by having supportive professors and peers which is what you find within IUP’s Anthropology Department. Now, I’m totally biased having started my undergrad career, taking the 2016 field school, and continuing my education into a master’s program here at IUP but that was my experience. I will always stand by my saying that we have an incredibly supportive department from peers to professors. Take advantage of this and you will enhance your field school experience. Hopefully you found this post helpful, and I hope you’ll be joining us for a field school at some point. 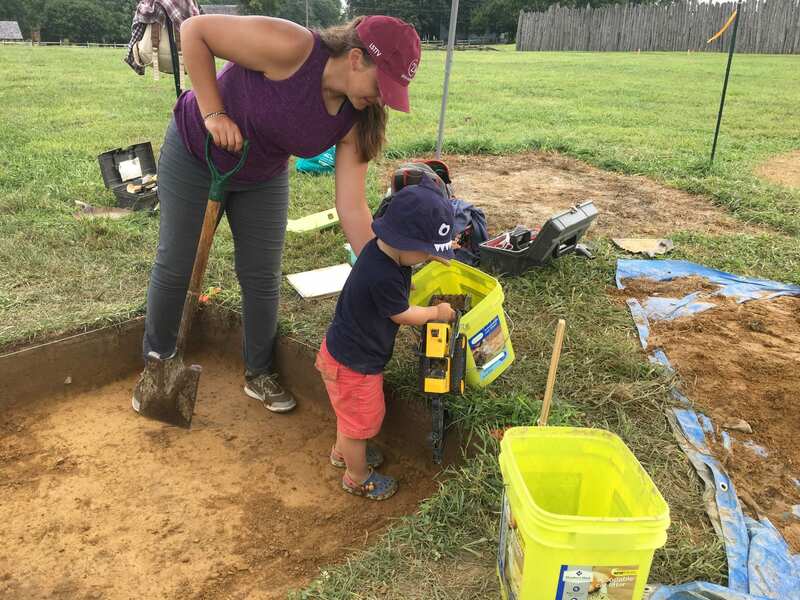 A young archaeologist in the making. Metarhyolite is a metamorphic rock which occurs naturally on the South Mountain, near the Pennsylvania-Maryland border. For as long as 10,000 years, metarhyolite has been quarried from pits dug into bedrock, and then shaped into blades and projectile points. 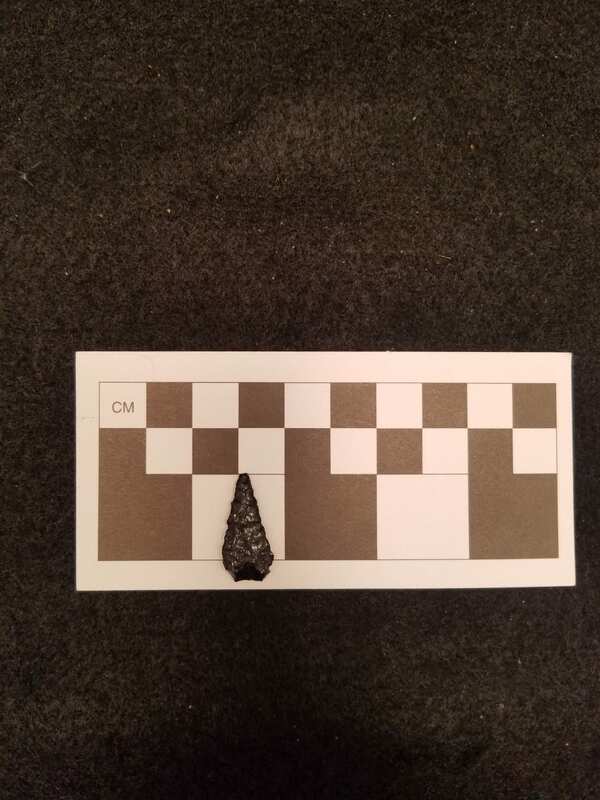 Between 5,000 to 2,700 years ago, the frequency of metarhyolite artifacts and the distances they are found at increased substantially (from the Chesapeake Bay to Western PA and Southern NY). The reasons for this are not well known. Michaux State Forest boundary in background. 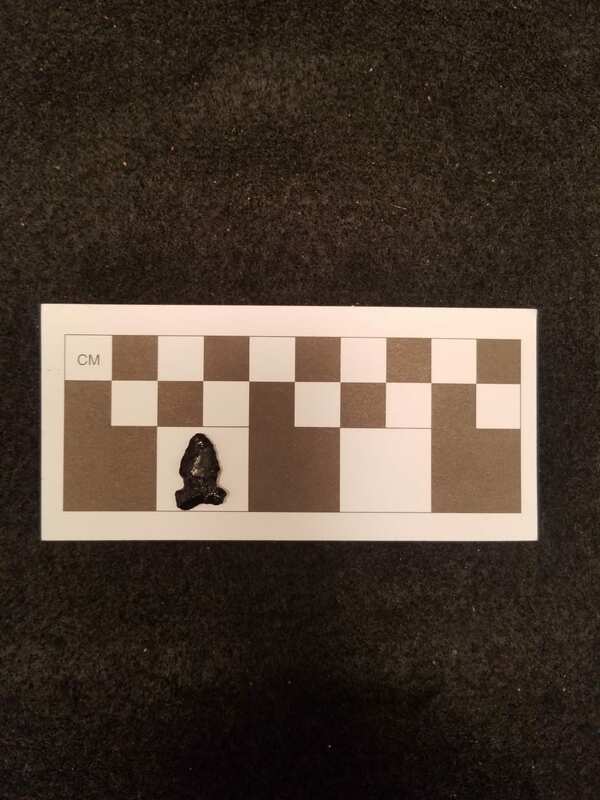 Representative photographs of metarhyolite artifacts and natural samples in foreground. Michaux State Forest in Pennsylvania currently includes much of the area that was quarried for metarhyolite stone-tool production. Evidence of quarrying can be seen on the forest floor – pits in the bedrock typically surrounded by the chipped stone debris left as evidence of past people splitting boulders into manageable sizes to transport out of the mountains and into the neighboring valleys to the East and West. Chipped stone debris at base of metarhyolite outcrop. The pit in the center is from looters illegally taking artifacts from the site. My thesis aims to incorporate our current understanding of the prehistoric quarrying in Michaux State Forest into the forest’s management plans and policies. Ongoing research of the quarries is only possible if they are preserved for future generations, and without a clear framework for managing the quarries along with the other resources that the forest manages, their preservation is in jeopardy. This quote sums up frustrations accompanying the management of archaeological resources at any scale quite well. Before management strategies can be developed, inventory and context are needed. In this case a variety of methods were used to collect information about the prehistoric archaeological resources in Michaux State Forest. A field survey coupled with Geographic Information System (GIS) development and analysis studied the distribution of prehistoric quarries throughout the forest. 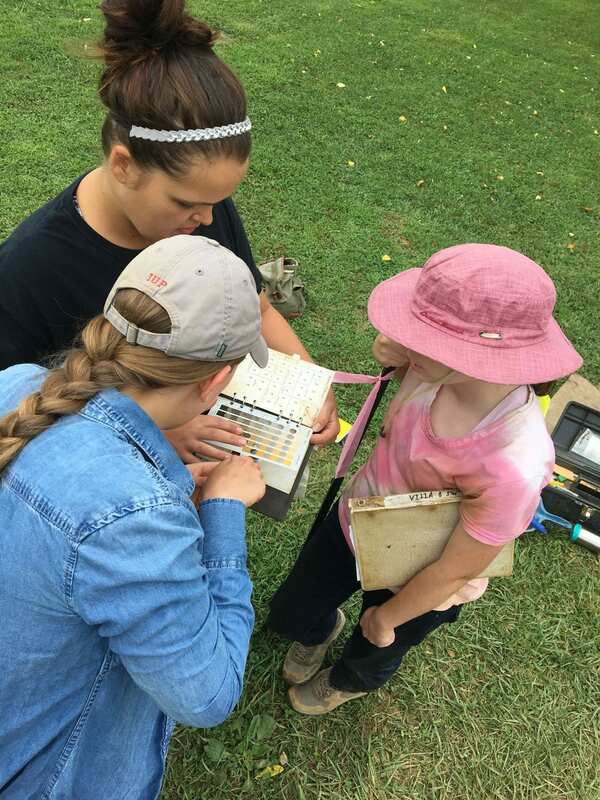 Geochemical analysis using portable-X-Ray Fluorescence (pXRF) and petrographic microscopy was used to describe the variable chemical and mineral composition of metarhyolite outcrops in Pennsylvania, Maryland, and in artifact collections found at archaeological sites around the region. The dashboard above display figures depicting the raw reading taken by the pXRF device for specific elements, as well as the results of Principle Component Analysis used to identify elemental factors contributing to the pXRF results. The maps correspond to the locations of the sample groups used in this study. 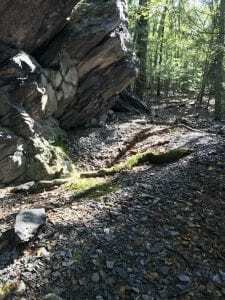 The results of this study have led to the development of management practices for the prehistoric quarries in Michaux State Forest, which will be presented to the Department of Conservation and Natural Resources, as well as the State Historic Preservation Office. There is ongoing consultation between the agencies, the research team, and the South Mountain Partnership which helped to fund the study. 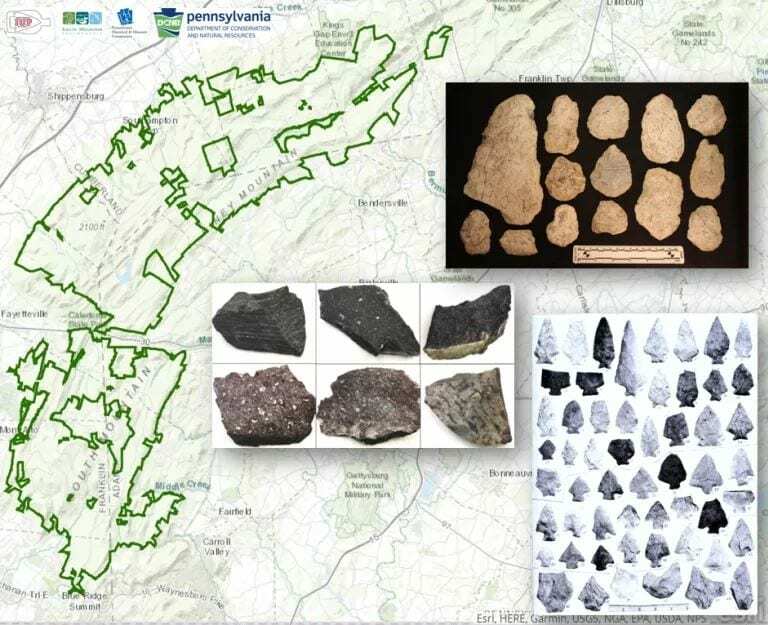 The project uses inter-agency collaboration and inter-disciplinary research to improve our understanding of the prehistoric quarries in South Mountain and help state agencies manage them more efficiently and effectively. Photo belongs to Ben-Gurion University. This site is Tel Be’er Sheva. Aixonidai Halai looks somewhat like this, except much less clean, and the walls are deteriorating much more than this. Also, there is so much dirt, the dirt is everywhere, even when you do your best to remove it from the rocks to make them clearer. The wind blows, and your entire trench is covered again. Overall though, the picture gives a pretty good idea of what I was working with in Voula. On the first day of excavating, our group of 8 was split into two different teams. My team was in trench A9 and the other team was working in trench A8. Archaeology in Greece is much different than archaeology in the United States, or at least in comparison to the field school experiences I’ve had. The digging style consists more of fast paced work using pick axes, hand axes, hoes and shovels to clear the dirt more quickly. Trowels are only used for articulation of features, such as walls, or for helping to make the trench walls straight. Not only is the digging style different, but so are the trowels which are used while digging. 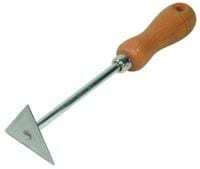 Non-Greek trowels are very common and used for many other purposes such as gardening or masonry. These trowels are sharp on two sides which connect into a point. Greek trowels are sharp on three sides, and the three sides connect to make the shape of a triangle. Due to my previous use of a non-Greek trowel, I was much more comfortable using what I was familiar with, but it was cool to get some experience with a different kind of tool. This entire excavation overall was a really interesting and different experience because you’ll only really get this kind of digging in Greece. The purpose of our excavation was to continue to discover the story which was uncovered by previous excavations of the area. The trench directly next to mine had stone walls intersecting and opened up into a giant courtyard which was then surrounded by more walls. The foundations of these walls are thought to belong to workshops, and we were attempting to find the remaining outline of these workshops. To start out in our trench, we first needed to remove all the topsoil which included weeds, foliage, and other modern contamination. To do this we each used pick axes across the trench, pulling up the weeds first before we could really dig into the dirt. Once we got a substantial amount of the topsoil ripped up, we would use hoes to create giant dirt piles which we then removed from the trench to start the process all over again until we reached the next layer. While digging we had to pay special attention to what we possibly could be hitting in the off chance we found something of importance. However, most of the inclusions in the topsoil are modern and are not relevant to the project. Once getting through the topsoil, the technique is started all over again, moving between pick axes, hoes, shovels and sometimes the trowels. Layer 1 quickly became much more interesting than the topsoil. In this layer we began to find materials which gave evidence of our progression towards the time period when these buildings were first built. Our progress of digging slowed as we were told to be cautious when encountering larger rocks as they could be the feature we were looking for. When we found a rock, we would dig around it until our layer was all flat, then we would articulate the edges of the rock to determine if it was just part of the building’s collapse, (meaning no other rocks would be found below it) or if it was actually important and needed to stay in the ground. This process continued for at least one whole week until we pretty much uncovered all of the important rocks and until most of the trench was completely level. The outcome of the findings from both trenches really helped to put things in perspective and helped to develop and challenge what had previously been found, and determined about the site as a whole. The team in A8 unfortunately did not find any large features or materials which indicated their space was a part of a workshop. They found rocks which contributed to collapse probably from the building which was found in my trench, A9. Despite not finding much, these women worked hard the entire time, and never complained about their situation. Luckily, though, my trench happened to continue and substantiate the story which was discovered before. Not only did we uncover one large wall, (which helped to give more shape to the walls which were found in the previously excavated trench beside us), we also found a wall which extended perpendicularly from the middle of this large wall. Our professor said this perpendicular wall seemed to have been built at a later time. It was only part of a wall, and seemed to stop purposefully, probably signifying an entrance into a small space which contained evidence of a pythos. This pythos was our big find!!! A pythos in Ancient Greece was a large container used to store materials such as grains or oils and helped to keep them fresh. In our trench, within the small adjacent wall, we discovered the semicircular outline of the pythos and then the presence of many floor tiles around the back end of the pythos, most likely indicating another entrance way into the storage room. In this area, where the larger wall met up with the smaller wall was also the presence of lots of charcoal and a permanently changed soil color. The charcoal and darkened gray soil color indicated at one point there was a fire in this spot, and in relation to the rest of the building, most likely a fire used to destroy the building after use. Another great find was the presence of steps next to the large wall signifying there was a possibility of at least one other floor in this building. In fact, our professor said by the size of the room, this building we were working in may have been one of the biggest at the site. This is why the other trench had much less luck finding things. A lot of the collapse from our building ended up in their trench. Also, if it was one large room then it would also make sense for them not to find much other than pottery sherds. 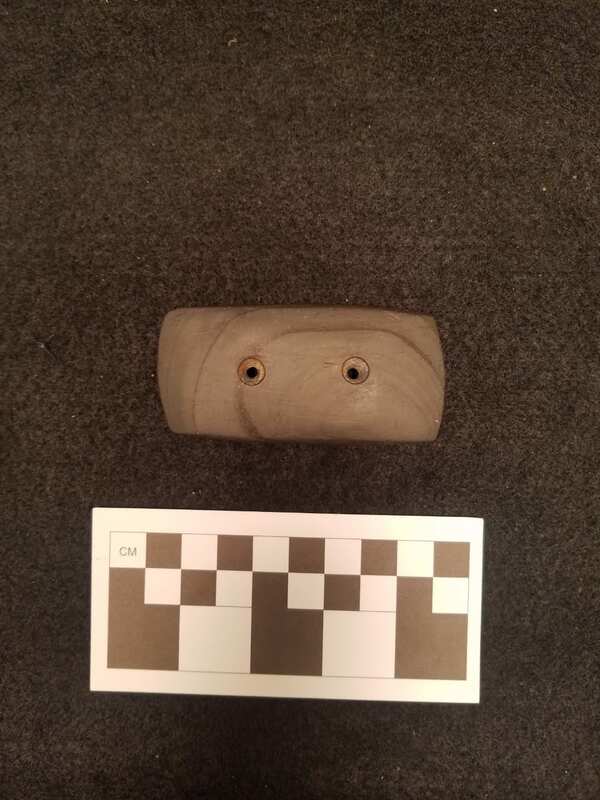 Speaking of artifacts, other finds throughout both trenches included pottery handles, stems, bases, fine Athenian blackware, some pieces of marble (not ancient), some building nails (most likely not ancient), some worked bone and shell, and plenty of floor tiles and roofing tiles. We actually found plenty of pottery and a handful of the other stuff throughout our layers but what we really wanted to find was the walls, or a hearth, or a pythos. The fact we were able to help so much and excavate to the best of our abilities and surpass our professor’s expectations was pleasing. It was a lot of fun and we all learned a lot. Yeah, we had to wake up at 5am each morning, and there wasn’t a site bathroom which made things interesting, the weather wasn’t the greatest the entire time, and we probably could have found more than we did, but none of that really mattered to us. We all worked our hardest and were proud of all our work. I would not hesitate to do it all again! Also, Voula is beautiful and I couldn’t be happier to have traveled to the coast every single day. Hopefully soon I’ll get the chance again to dig, and travel. I’ve never tried to hide it, I am a huge geek. Something I’ve been following closely for the past few years is virtual reality. VR technology has been around since the 1970s, but it wasn’t until 2012 or so when the Oculus Rift hit the scene that VR became more accessible for the average consumer. Of course, there was Nintendo’s Virtual Boy released in 1995, but it didn’t really catch on. Since the Oculus Rift is still in production and has spawned numerous generic devices, I’m using it as the current standard of home VR technology. Anyway, VR has become more widely available in the modern market and has been used for everything from videogames to training medical and military personnel. Within the past few years, the realm of archaeology has really started to play with VR and I for one am ecstatic. VR within the realm of archaeology has focused on the obvious of bringing sites to people. This is done by using reality capture techniques (like photogrammetry, LiDAR, and sonar) that scan a site and allow for the creation of a digital model. Bringing the sites to people encourages education of archaeology and could potentially reduce tourism related issues at sites. There’s always the devil’s advocate approach, worrying that this could encourage looting, but let’s try to be positive about the general human population for a moment. Still, VR goes beyond bringing sites to the public. As of 2017, the Smithsonian Magazine reported VR had been used to reconnect the Tejon tribe with sites of their cultural heritage. Now, this may be no different in the execution of reproducing the site, but there is an actual connection here between people and the site. This is only from within the first few years of VR really taking off with the public, I can’t wait to see how far it can be taken. Imagine, one day you may be able to put on a VR headset and look at any site in the world (assuming it’s been digitized). Better yet, you may be able to interact with artifacts in situ. Or how about going on a virtual excavation to better understand the site, doesn’t that sound amazing? It’s all possible, but there’s a catch. This can’t be done for free, you need to do all the coding to interact with the artifacts and purchase or rent equipment to produce the site model itself. You can’t forget the cost of whoever has to initially record the site plus whatever expenses there are for the archaeological examination. In short, this is pricey now, but it’s possible that the costs will decrease through time as it gets easier to do this kind of work. Despite the current costs, I hope VR becomes a staple of public outreach in archaeology. I really think the possibilities are only limited by our imaginations here and that this could become an incredible teaching tool for future generations. Future Archaeology and… Aliens? Wait… What? I feel like this needs a disclaimer, I was just trying to amuse myself in writing this. This is not to be taken seriously, but if you want to continue the conversation then just leave a comment. One of the most attractive aspects of archaeology, in my opinion, is the ever-expanding nature of the study. We create more archaeology as we live, so we could never learn everything (even excluding all the data that has been lost). This means that there will always be archaeology which I find amazing, but there’s also a sadder aspect to that. We will never know everything. Are we piecing together scraps of the past in a futile attempt to leave our mark? I think that we’re making some difference, that what we’re doing is not a waste. But if we will never know everything, I wonder why this will be the case. I’ve pondered this quite a bit, and frankly, I haven’t come up with any positive answers. This is where things are going to get a bit weird, and maybe I’m trying to look too far forward, but I think it deserves a mention. We as a species will go extinct at some point. Now, this could be from any of the infinite possibilities and scenarios. I’m not going to get into hypotheticals because your brain will tell you a better story than I can and that’s not my purpose here. Obviously if we go extinct then we can’t learn about the past anymore as we have all become the past and there is no current or future. What I wonder is if we as humans will be uncovered at any point in time beyond extinction. I am personally a firm believer that intelligent life exists beyond Earth. This does not mean I believe that they have ever contacted us in any way, shape, or form. I simply believe life exists beyond what we know. Assuming some other life form would come across our remains, would we have left enough information for them to understand us? Forget the odds of another species being able to translate our written thoughts and ideas. Would another species even care about us being some lost civilization? I don’t know and frankly I’ll never be able to answer that. Technically aliens could do archaeology, after all it is a study of humans and I’ve never seen it defined as a study by humans. I feel like aliens doing archaeology would be kind of funny. Especially if they uncover a recording of the Ancient Aliens guy. I don’t know how a conversation between other intelligent life would go, but the thought of aliens calling that guy a liar just makes me chuckle. Something I’ve found myself thinking more and more often is that working in the wet lab, processing flotation samples, is relaxing. Now, this could just be the tired mind of a grad student enjoying a few moments of peace and there’s some truth to that. However, there’s more to it. It’s been feeling like a productive therapy session. There’s something fulfilling about taking liters worth of samples and revealing what the soil has hidden, particularly of the legacy collections that have been keeping their secrets for thirty or forty years. Although, I don’t know what will happen with the materials retrieved once they have been bagged and labeled. Sure, some materials will be examined sooner or later for research questions that might not have been asked yet. However, I have a suspicion that those of the legacy collections, which sometimes are more plastic (from the degrading trash and/or sandwich bags originally used to store them) than anything else, may just be stored away indefinitely. It seems like a shame, but I hope this material will be examined at some point. It may seem sad, but it’s fun to wonder what this material could contribute to archaeology. Perhaps this will inspire me to pursue researching micro-artifacts, including those of these abandoned collections That’s enough of my rambling for now. For anyone unfamiliar with flotation or what exactly I’m talking about, keep reading and I’ll try to make it short. If I didn’t make this clear earlier, flotation is a process that separates tiny artifacts, plant materials, and the like from soil through water. These artifacts separate into two groups called the light and heavy fractions. Perhaps unsurprisingly, the light fraction floats in the water while the heavy does not. We at IUP are fortunate enough to have a flotation machine which cuts the amount of time and effort put into collecting these microartifacts. 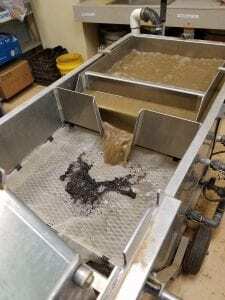 You do not need a flotation machine to do flotation, a bucket of water and a sieve will suffice, but it makes the process far easier. In the case of a flotation machine, you have a pump that keeps the water flowing and helps to agitate the sample and separate the soil and microartifacts. You pour a sample into the main compartment, gently. The water flows through an opening, carrying the light fraction, and then through a screen that collects the light fraction. The heavy fraction remains in a removable screen in the main compartment and gets collected once the light fraction has finished collecting. The machine gets cleaned out when changing sites, and just every so often, to avoid accidental contamination and to keep the machine functioning properly. If I left you with more questions than answers, leave a comment and I’ll try to answer you ASAP. All credit of this post goes to the president of the Society for American Archaeology, Susan M. Chandler, RPA. I would have preferred to post a link to this statement in light of the recent government shutdown, unfortunately I could not find such a link. For clarification, this piece comes from the most recent (Jan 2019) edition of the Society for American Archaeology’s Government Affairs and International Government Affairs newsletter compiled by David Lindsey. I post this today with the intent of providing one of many viewpoints of the recent government shutdown. Within the foreseeable future, we hope to have a companion piece authored and posted by a source from within the CRM industry to present an additional narrative. At long last, the government shutdown is over – at least for now. Furloughed government workers are returning to a backlog of missed work and are assessing what damage may have been caused to cultural resources while they were away. In contrast to previous shorter shutdowns, the Department of Interior recalled 800 employees to issue drilling permits during the shutdown. According to the Western Organization of Resource Councils, 224 oil and gas drilling applications were processed, 22 permits were approved, 15 oil and gas leases were sold, and thousands of acres of subsurface mineral rights were leased during the shutdown. 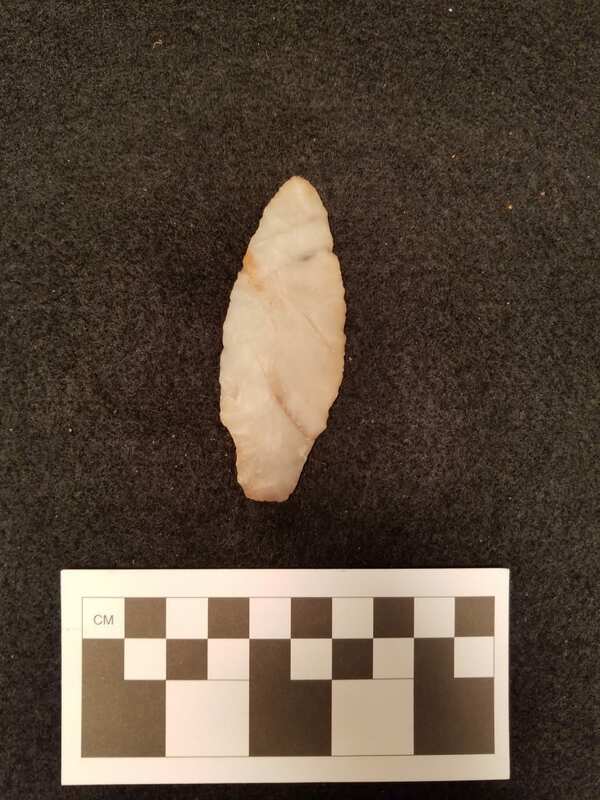 In contrast, no federal archaeologists were available to process archaeological permits, review reports, or analyze potential impacts to cultural resources from energy extraction or other projects. Cultural resource consultants who rely on federal contracts, federal permits, or federal compliance review were also impacted by the government shutdown, as were university programs receiving federal funding. SAA’s 2015 member needs assessment survey revealed that roughly 7 percent of SAA members (roughly 500 archaeologists) work for the federal government, and an even larger number of members do the bulk of their archaeological work on federal lands or with federal funding or permits. The American Cultural Resource Association is compiling shutdown stories to share with legislators about how the shutdown affected archaeologists’ ability to do our jobs. If you have a shutdown story, please share it at https://www.acra-crm.org/acrasphere/7135390/Reply?replyTo=7135390#7135390. I have received some feedback asserting that SAA was wrong to have taken a stance against funding for the border wall when urging members to contact their Senators to end the shutdown. I want to clarify that our opposition to the wall is based on the very real threat that construction of a border wall – or border fence – will be done without any archaeological surveys or mitigation of impacts to archaeological sites. In August 2018, the Coalition for American Heritage (CAH) filed comments with the Customs and Border Patrol regarding their decision to waive crucial preservation and environmental laws to expedite the construction of 33 miles of fencing in the Rio Grande Valley along the U.S. – Mexico border, stating “This decision will endanger irreplaceable cultural heritage resources, including numerous archaeological sites that would otherwise be considered prior to construction.” We have every reason to believe that, should the administration receive funding to build additional segments of border walls, they will continue to waive national historic preservation and environmental laws to expedite construction. SAA will continue to advocate with the new Congress for continued adherence to existing federal legislation protecting cultural resources, for stronger laws to safeguard against the export of looted antiquities, and for adequate funding for cultural resource programs. We are optimistic that the new Democratic leadership in the House will be receptive to our message and will continue to reach across the aisle to key Republican members of Congress to assist us in our efforts. Again, we hope to have a companion piece posted soon to provide an additional narrative of the effects of such a shutdown.